We were established with the goal of letting a fresh breeze blow into the small and medium manufacturing industry. Our company started business January 1, 2016. It mass produces titanium aluminum turbine blades for a next generation jet engine (called “LEAP”) based on a direct contract with SAFRAN AIRCRAFT ENGINES (formerly SNECMA) in France. 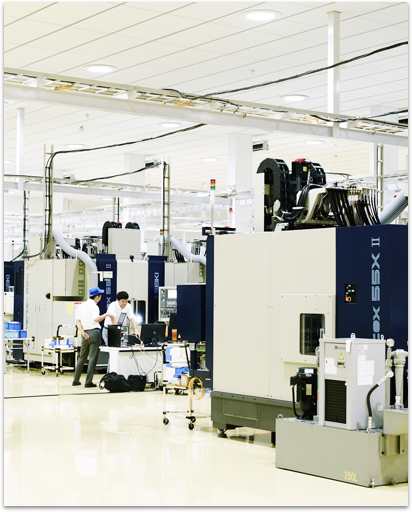 Mass-production began in August 2016, a few months after the head factory was completed in Ashikaga, Tochigi Prefecture. 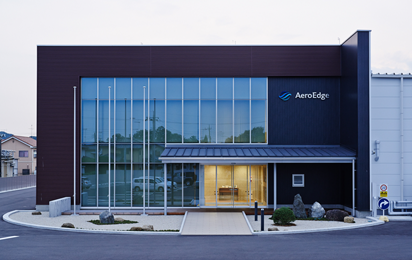 It has only been a short period since AeroEdge began as a full-scale manufacturing company. This newness can be considered an advantage, one that highlights creativity to form the most important action guidelines; this develops meaningful work in the global aerospace industry, which refreshes the way Japan’s small and medium manufacturing industry exists. and built a bridgehead in the global market. In fact, we sought to enter the global aviation manufacturing business long before 2016. Given the uncertainties associated with the supply-chain restructuring of the automobile and construction machinery manufacturers that were the main customers during that time, and combined with the uncertainties of the global economic outlook beginning in 2000, we looked for the area in which we could take advantage of the technological capabilities. After comprehensive consideration, we concluded that the global aviation manufacturing business was the most suitable industry to enter due to the industrial scale, the growth potential, the high added value and the existence of a high hurdle worth the challenge to overcome. The first step was trading with the major Japanese aerospace industries. By the time business occurred in the mid-2000s, we overcame many challenges to better answer customer demands. Through these activities, we learned a lot, including acquiring technical certifications and how to progress the business with global aviation OEMs. In this sense, our present situation strongly owes our predecessors who have supported the Japanese aerospace industry so far and have established trust and certain techniques. We would like to become one of the leading Japanese aviation companies in the near future. Set up our “capability” for entering the global market in 2016. As of June 2017, our mass production of the turbine blade is finally on track. In addition, we think our experience has prepared us for the minimum “capability” to enter the global market. First, we built a system to create one contract to cover development, mass production and quality assurance. The ability to do everything from supply chain management to quality assurance is always required by customers and is a necessary condition for conducting direct dealings with global OEMs. We have, for instance, established the foundation of an autonomous in-house training system of inspectors who are internationally certified in quality assurance. The second “capability” is understanding the processing know-how of hard-to-manufacturing materials, such as titanium-aluminum and other composite materials. New materials widely used in the aviation field are difficult to manufacture. We have accumulated the knowledge to respond reliably to customers’ production requirements from a mid- to long-term perspective. This includes the establishment of the methods needed to process these difficult-to-cut materials and the resulting learning curve related to the perspective of mass production through the management of our main business. The third “capability” is understanding the global aviation industry network. Since AeroEdge was founded, we have been hurriedly building relationships that enable us to have direct conversations with aerospace OEM companies located in many Western countries. We have done this by presenting topics, almost monthly, at overseas exhibitions and establishing direct opportunities to talk business. We will continue to create something from nothing on a global basis. Of course, it cannot be said that what we have built during the past year is enough. However, in the future, in an age in which the environment surrounding the aerospace and defense industry—and eventually the manufacturing industry—is about to change drastically, we will use the assets we have built and continue to develop to implement globally meaningful work. To set the company’s direction, we will focus on four main policies. First, we are searching for a new way to manufacture products in the aeronautical industry. Our current main business focuses on the aviation industry, and in this industry, we will establish the next business venture by following the LEAP business model. Going forward, we aim to acquire business that secures added value in the mid and long term by seeking a strategic position in the global market. The second policy is the promotion of agile, bold, global market-penetrating activities. To understand the potential demand of the market and the timely response to the customers’ requests, I would like to take the basic stance of traveling anywhere in the world without hesitation. The third policy is innovative business development through broad and flexible inter-company collaboration. We want to build a collaborative relationship from the perspective of creating a business with flexibly diverse enterprises, starting with the development of new businesses. Finally, the fourth policy is the diversity of business development based on acquired know-how and networks. One future project we plan to pursue will take us beyond the manufacturing industry. We seek to diversify businesses that can demonstrate leverage without compromising the know-how and networks we have cultivated in the manufacturing industry.